With Google+ opening up to the public, I think we’re going to be seeing some huge numbers flocking to it. With that in mind, all of our friends and co-workers will no doubt be using Google+, and because of this we should really learn about some of its features. 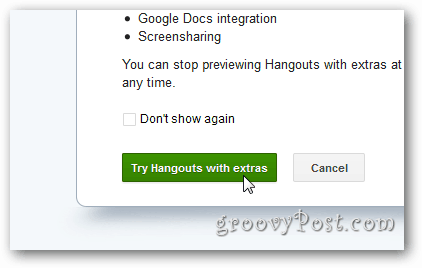 Today I’m going to show you one of these groovy features called Hangouts. You might be saying this is old news because Google had Hangouts since the beginning which is true, however it wasn’t until yesterday that Google officially opened Google+ to the public that it announced a few new features: Hangouts on your phone and Hangouts On Air. Hangouts on your phone allows you to use your 3G (more on this in a minute), 4G/LTE or Wi-Fi connection to video chat with your friends on your phone. Now I know that Skype, Facetime & Qik have been doing this for a while now, but this is something more than just a one-on-one video chat. With Google Hangouts, you can have up to nine other people chatting with you. Now before you get to excited, I think Google is still working to fully integrate Hangouts with your phone because today, it’s not possible to start a Hangout from the mobile Google+ app. You can join a Hangout that’s already created however you can’t create one. Granted I was able to hack it by creating a hangout on my desktop then joining it but that’s not realistic in the real world. I also did some testing of Hangouts on a 3G connection and I found the quality to be pretty bad. Now granted, at the time I had a lousy 3G signal so this probably wasn’t the best test-case. That being said, that’s the real world. My recommendation would be to stick with WiFi when using Hangouts on the Phone or only use 3G if you’re in a pinch. The phones that are working with this today are of course Android phones, but you must be running Android 2.3 or better. As a note, if you already have the Google+ app installed you’ll need to go update it manually to make sure you get the latest version which allows the mobile Hangouts to work. If you don’t have the app already you can go to the Android Market and download it today. Also while it’s not quite ready, Google did announce that very soon the mobile Hangouts would be available on the iPhone as well. iPhone/iOS Update: Google just released an update to the Google+ App for iPhone and other iOS devices. Now these same Hangouts features apply to users of those devices as well. Hangouts On Air is another great feature. On Air is basically a way for you to record and broadcast your Hangout live. Let me start by telling you that this feature is limited for now. If you don’t have the option to broadcast and record your session you’re not alone. As of today, I don’t know anyone who is a broadcaster, unless you count will.i.am. Starting yesterday though, any Google+ user can view the public broadcasts as a spectator. Sounds like something I would call YouTube Live. This is a feature to keep an eye on. With the ability to not only broadcast video but also have nine others joining in. The possibilities are endless. Can you say–Live Video Podcasting? Google is trying out a few additional features that it says might not last long so if you want to try them out, be sure to leave feedback if you want them to stick around. In order enable the extras, click Hangouts with extras when you’re in the “Check your hair and make sure your mic works!” screen. 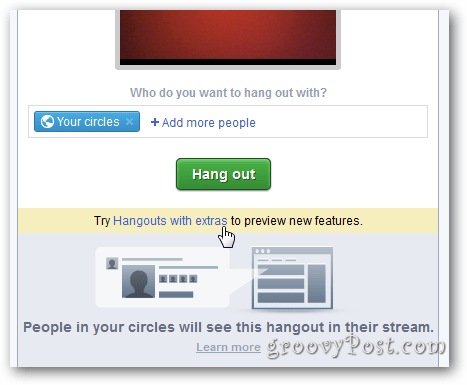 Then click Try Hangouts with extras. Screensharing: for showing others your own computer screen, maybe showing them photos, or conducting a small meeting with slides, or anything else. Sketchpad: for drawing or doodling together. This has several uses I can see friends using this as well as maybe work-mates. 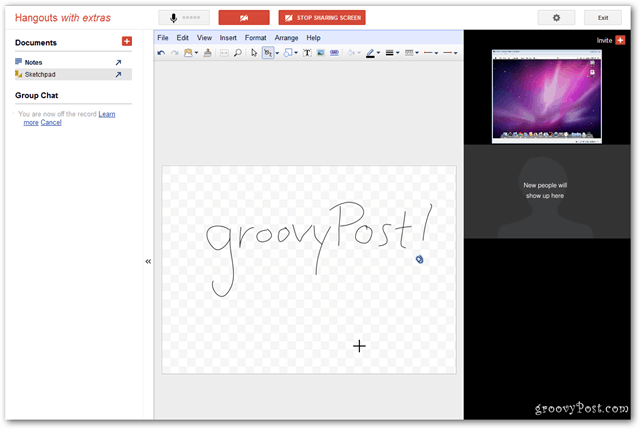 Google Docs: for writing, presenting, etc. Really a ton of uses for this and I think you’d probably see this uses more in business. Named Hangouts: for, well naming your Hangouts that you want to put public about a specific topic. It’s worth mentioning that Google is opening up the Hangouts Service by allowing DEV’s to start playing with a new Hangouts API. If you’re a developer or are just interested in this Google+ Hangouts API the Google+ Blog is the place to start. Google is really pushing its Hangouts service to a new level and frankly, Facebook at this point has nothing to offer which is even close to this level of communication and collaboration. It’s features like Hangouts that really make Google+ standout and get people excited enough to make a jump from other social networks. I like what I’m seeing from Google+ right now and if Google continues to out-innovate its competitors, I have a feeling the social landscape is going to look very differently in 12-18 months. 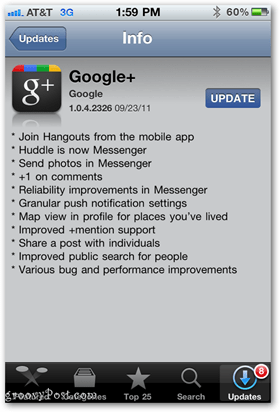 What are your thoughts on Google+ and the new Google+ Hangouts features just released? I would love to hear your feedback and stories in the comments section below about how you’ve been using Google+.